is easy if you follow these simple directions. Monitor the distances on your odometer! 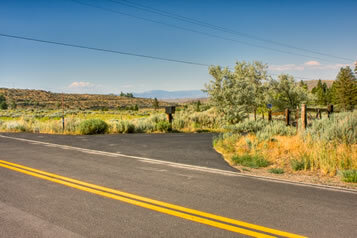 From Reno drive south on the US 395 through Carson City to Minden. Turn right at the first traffic light onto State Hwy 88. About 2.3 miles after crossing the Nevada/California border look for the turnoff to Diamond Valley Road and make a left turn there. Immediately after that make a right turn onto Carson River Road. Quail Hollow is on the left side at about 1.3 miles. From Woodfords drive north on State Hwy 88 for about 1/4 mile and turn right onto Carson River Road. Quail Hollow is on the right side at about two miles. Coming from the north or east, drive to Reno and use the "From Reno" directions from there. 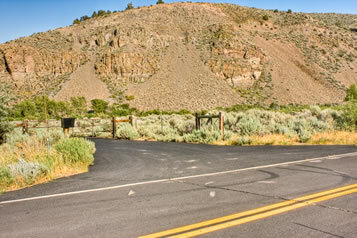 Coming from the south on US 395, turn left onto State Hwy 88 at the north end of Minden and continue from there as in the "From Reno" directions above. Drive east on Interstate 80 to Reno and use the "From Reno" directions from there. Drive east on US 50 over Echo Summit and turn right onto State Hwy 89 in Meyers. Continue over Luther Pass to Pickett's Junction and make a left turn there. Continue to Woodfords and follow the "From Woodfords" directions from there. Drive east on Interstate 80 to Sacramento and use one of the "From Sacramento" directions from there. Drive east on Interstates 580 and 205 to Manteca and turn north onto State Hwy 99. Continue to Stockton. Drive east on State Hwy 4 through Angels Camp, over Ebbets Pass and through Markleeville to Woodfords. Follow the "From Woodfords" directions from there. Drive east on State Hwy 88 through Jackson and over Carson Pass to Woodfords. Follow the "From Woodfords" directions from there. Approaching from the north, this is how the entrance to Quail Hollow looks. The keypad for the gate code is located under the mailbox on the railroad tie. After passing through the gate follow the road to the first turn and enter the unpaved driveway to the right of the iron Quail Hollow sign. You have arrived! Approaching from the south, this is how the entrance to Quail Hollow looks. The keypad for the gate code is located under the mailbox on the railroad tie. After passing through the gate follow the road to the first turn and enter the unpaved driveway to the right of the iron Quail Hollow sign. You have arrived!